Deer are voracious grazers, and the foliage of many spring bulbs offers an irresistible treat at a time of year when few other food sources exist. And if above-ground vegetation is very sparse, deer can and will dig up the ground to get at the bulbs themselves. Fencing is an option but comes at a price and can detract from the appearance of your landscaping. Fortunately, deer are selective in the bulbs they choose to eat; pick the right ones, and you may be able to protect your flower beds. Experts know enough not to use the term "deer-proof" lightly since deer will eat most anything. There are only a very few bulbs that can truly be called "deer-proof." There are, however, a good number of bulbs that can be accurately considered "deer-resistant." These are bulbs that deer generally leave alone unless they are very desperate for food. 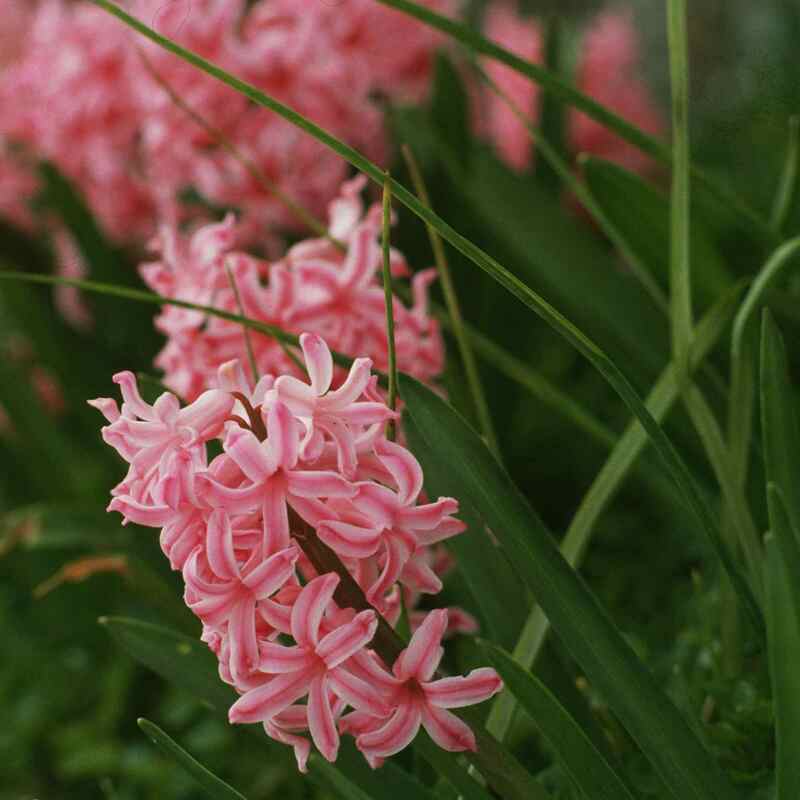 Hyancinths are one of the very few bulbs that can legtitimately be called deer-proof. The bulbs are poisonous to deer, squirrels, and other bulb-eaters. Nor will do deer eat the flowers and foliage once the bulbs bloom. Because hyacinth flowers occur in clusters on a flower spike, hyacinths are showier than any of the other plants on this list. They are also the most aromatic of the spring bulbs. And that's one reason why deer disdain them: Powerful fragrance seems to be one of the best protections that plants have against deer incursions. Don't confuse these hyacinths (Hyacinthus orientalis) with grape hyacinths (described below). Hyacinths typically appear a bit later than the early-spring bloomers, such as crocus, grape hyacinth, and snow drops, and have flowers that are quite large and showy. Like hyacinths, daffodils are toxic and therefore fully deer-proof. Deer rarely touch them, and even squirrels leave them alone. Daffodils are widely recognized as among the most beautiful bulbs that are fully hardy in cold regions; there are hundreds of varieties in various shades of yellow, cream, and white. Most daffodils bloom in the early spring along with tulips but slightly after the snow-lovers such as crocus and snowdrops. They can be planted in formal garden beds, but are also frequently naturalized in lawns and woodland settings. Snowdrops (Galanthus nivalis) are one of the first plants to pop up in late winter or early spring, sometimes even before the snow has completely retreated. A member of the amaryllus family of plants, this one, too,can legitimately be called deer-proof, since it is toxic to animals. Although the individual flowers are tiny, snowdrops can gradually spread and naturalize over the years, forming impressively large white drifts. Another plant that won't interest local deer is the early-blooming glory-of-the-snow. If you're not a fan of white flowers, such as snowdrops, take note that glory-of-the-snow doesn't come only in white—other options are light pink and blue. Glory-of-the-snow (Chionodoxa; the Greek Chion means "snow") should be planted in fall. As with all plants bearing small flowers, it needs to be grown en masse to produce an appreciable visual effect. Perhaps the most well-known of the early bulbs that peek up while snow still blankets the ground, crocus are generally left alone by deer, although they are not truly deer-proof. When food is in very short supply, deer might eat crocus foliage. Rabbits and squirrels, however, will quite happily dig up the bulbs. Once a crocus has been thoroughly munched, it's gone for the year. Many people protect crocus in the spring with wire netting to protect them from deer and rodents until the blooms have faded. Blue flowers are greatly sought-after by gardeners, and Siberian squill (Scilla siberica) is a wonderful source of blue for the early spring garden. A favorite cultivar, 'Spring Beauty,' is more robust in all ways than the species plant. That's apparent immediately as the plant first breaks through the ground in spring, unfolding leaves that are much thicker than those of the species. But it's not only with its leaves that this cultivar flaunts its superiority over the species. Scilla siberica 'Spring Beauty' bears fewer leafless stalks, and each blooming stalk produces as many as six blooms. Deer tend to avoid nibbling on Siberian squill, but chipmunks and other rodents may dig up and eat the tiny bulbs. Grape hyacinths (Muscari armeniacum) are quite distinct from true hyacinths. Grape hyacinths bear smaller flowers that are bell-shaped, whereas true hyacinths have flowers shaped like little starfish. The "grape" in the name derives from the fact that the flower clusters resemble bunches of grapes. Grape hycinths are an early spring bloomer, appearing well before the regular hyacinths, Hyacinthus orientalis. Grape hyacinth is often planted is masses in the open, where it spreads to form delightful drifts of color in early spring. Deer tend to turn their noses up at allium; the most likely reason is that, as a member of the onion family, it produces a strong flavor and smell. There are various white alliums, blue alliums, and purple alliums, as well as pink, as shown here. There are even some that bear yellow flowers. While the flowers are beautiful, they can be dangerous for pets—they are toxic to dogs and cats if ingested. 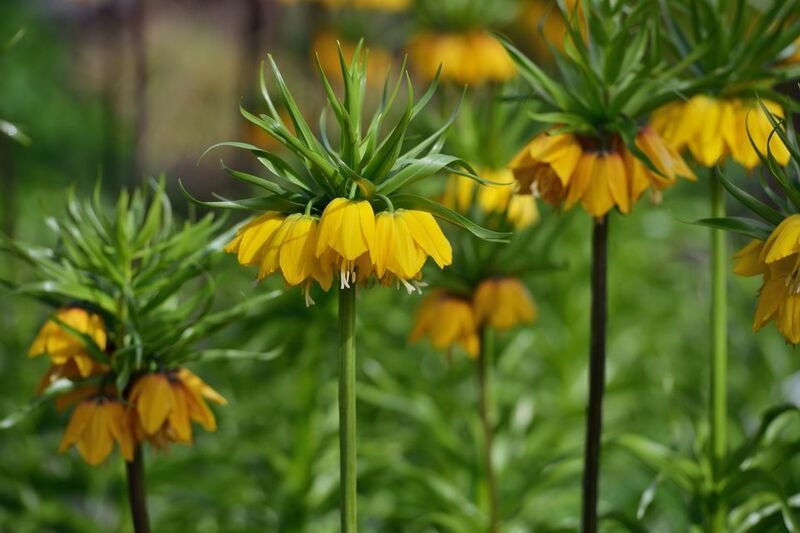 Fritillaria imperialis, commonly known as "crown imperial," is a bold beautiful, deer-resistant option. It is a somewhat exotic looking bulb, standing 2 to 3 feet high with rings of bell-shaped flowers hanging under a crown of leaves. Fritillaria is a mid-spring bloomer; it is often planted in combination with daffodils and grape hyacinth. Lily-of-the-valley is often used at weddings, being fragrant and white, but it's an invasive plant in some regions. Constantly having to defend your perennial bed against an unwanted intruder has a way of souring you on the "romance" of a plant. Also unromantic is the fact that lily-of-the-valley is toxic. But if you're more worried about deer eating up your landscaping, then you may just fall in love with lily-of-the-valley. Lilly-of-the-valley blooms in April, and it is often planted in shady areas where a quick-spreading ground cover is wanted. Again, beware of its invasive tendencies. Netted iris, also commonly called reticulated iris, will catch your eye in the first part of spring with its purple flowers accented with a bit of yellow and white. The name of this iris derives from the pattern evident on the dry bulbs. There are good and bad aspects to this iris. If you are looking for something small, you will get it with netted iris, which is classified as a dwarf. On the negative side, it lacks the aroma you may have come to associate irises with; nor is it long-lived. This bulbous iris blooms about the same time as snow-drops, glory-of-the-snow, and the early crocuses. It is best planted in masses in sunny areas and works well in rock gardens.